Discussion in 'All About SoWal' started by kurt, Aug 22, 2015. SoWal Local Prudence Farrow Bruns new book is rated 5 stars. Dear Prudence: The Story Behind the Song is available locally at Sundog Books. You just might see her there among the shelves. Also available at a bookstore near you, and on Amazon. In 2012, Prudence was part of a film crew who traveled to India to film Kumbh Mela, a festival that takes place for several weeks every 12 years, and attracts millions of visitors. She has given several talks in the SoWal area about this amazing event and some of her group's experiences there. At the young age of 18, Prudence, the daughter of actress Maureen O'Sullivan and writer/director John Farrow, became interested in yoga and transcendental meditation, which she studied at UCLA. Two years later she went to India to study with Maharishi Mahesh Yogi and became a T.M. teacher. At that time her fellow meditators included the Beatles, who wrote the song “Dear Prudence” about her. Over the years Bruns studied with various noted Indian swamis. From teaching T.M. in Manhattan and Boston in 1968, Bruns has continued to study and teach it in many places. She estimates she has taught T.M. to thousands of people in the U.S. and Canada. Since 1980, Bruns has also been involved in various aspects of show business, including writing screenplays and producing movies. In 2007 she received her Ph.D. in South Asian Studies, Sanskrit, from the University of California, Berkeley. She has published a book on Ayurvedic pulse diagnosis along with articles on South Asian studies, world religions, Ayurvedic medicine and healthy living for academic journals and magazines. She founded the Dear Prudence Foundation in 2012 to create scholarships for the programs of Maharishi Mahesh Yogi. In 1969 she married Albert Bruns, also a T.M. teacher. They raised three children and have four grandchildren, and now live in Seagrove Beach. Those who know Albert know he is just as interesting a human as his lovely wife. 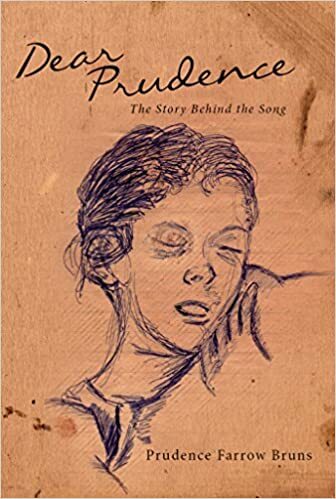 Many years ago Albert sketched the portrait of Prudence that is now the cover of her book. Prudence finally sets the story straight. Her memoir speaks to her three-month self-imposed meditative seclusion in India in 1968, while also carefully examining the universal experience of the 1960s youth movement. Dear Prudence books available locally at: Sundog Books, Hidden Lantern, and Nicola Paloma at Monet Monet in Grayton Beach. Prudence will be at #love _sewn + nicole paloma grand opening in Grayton Beach on Mon, Sept 7 for a book signing and yoga, 1:30-3:30pm.